At first, I thought anyone who paid for a box for their cat to sit in had way too much discretionary income. Having ordered from the Grommet many times previously, I figured it must be something good. Our cat, Spike, loves sitting in small cardboard boxes, before they go to the recycling bin. I finally gave in and ordered one. I put it in front of his favorite window. He jumped right in (much to my daughter’s delight) and he absolutely loves it. He is snuggled in there every morning, waiting for his breakfast. We are so glad we bought it! Great idea! I bought this for my daughters cat and it only took him 10 minutes to climb in and take a nap! A definite plus, built well and looks much nicer than a cardboard box!! I have several cats and when the box first came many of them had to try it out. They actually took turns using it. Now it does still get used once in a while just not every day. Oh my! Maggie our cat just loves this bow. She’s in it all the time and she plays with it by putting her toys in it and pouncing on the toys and the box is sliding across the floor. Would definitely recommend it for anyone who owns a cat. My cat who sits in boxes is still checking it out. I put one side down and she walks into it, then out. I tucked a "blankie" in and it appears to have been conformed to the box so she is still getting acquainted with it. Tried a locating in a few places she likes to lie. It's coming, probably another week. I saw several reviews complaining that this box is too small to fit an average-sized cat. And when I first received it, it looked very small and I figured it wouldn't work for our 14 pound box-loving cat, Alba. But I set it out in case one of our smaller cats decided to try it. I was happy to see that Alba did try it. And that all 14 pounds of her fit perfectly inside. It was snug, but it expanded just enough to conform to her shape, giving her a great fit and the compression feeling she likes. Great item! My kitty, Porkpie, absolutely loves her blue kitty box. When she comes downstairs at night to eat her dinner, she eats 1st, then walks into the living room where her 'blue box' is located right next to the sofa. She crawls right into it and watches TV with the family or just goes to sleep. It's perfect and I am so happy that I purchased this kitty box for her. 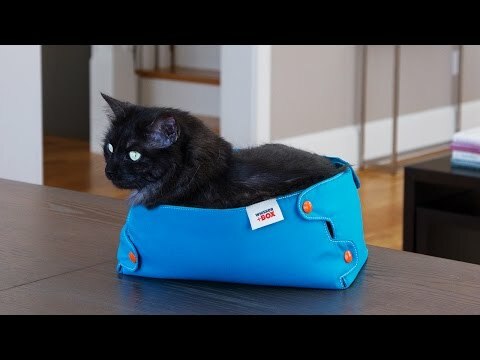 A great item for kitties.